Student researchers at MIT have concluded that given current technology, any colonists to Mars would die after about 68 days. Mars One, the company that hopes to put people on Mars by the 2025 (and film a reality TV show there, so you know they're legit) insists that the MIT researchers are wrong. But as any student of paleo-futurism would know, even the most optimistic space prognosticators of the past century would side with the MIT students. 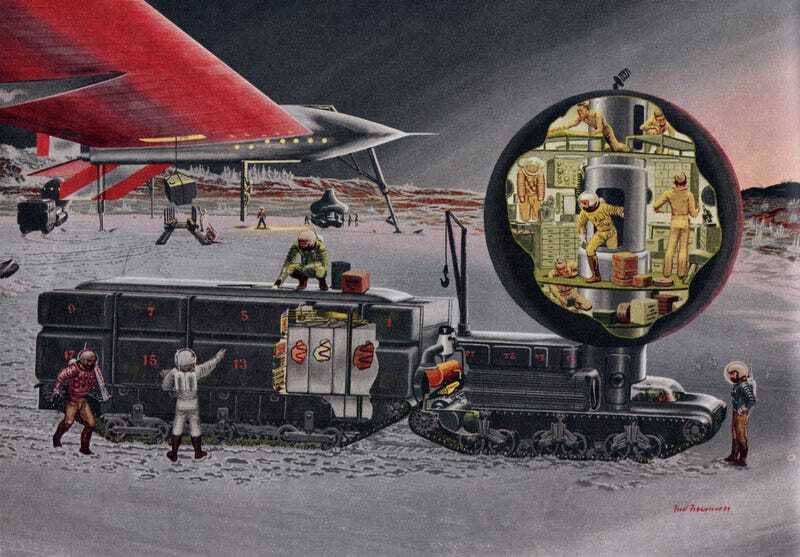 To take just one example, let's look at the April 30, 1954 issue of Collier's magazine, which featured a splashy feature article dedicated to the future of exploring Mars. It was quite optimistic, and no doubt inspired countless kids to think that they might live in space stations by the time they were adults. But when it came to Mars, space pioneer (and former Nazi scientist) Wernher von Braun didn't mince words. It would be "a century or more" before humans set foot on the red planet. Will man ever go to Mars? I am sure he will—but it will be a century or more before he's ready. In that time scientists and engineers will learn more about the physical and mental rigors of interplanetary flight—and about the unknown dangers of life on another planet. Some of that information may become available within the next 25 years or so, through the erection of a space station above the earth (where telescope viewings will not be blurred by the earth's atmosphere) and through the subsequent exploration of the moon, as described in previous issues of Collier's. Any time people insist that we'll go to Mars in the near future, I always think about Wernher von Braun's 1954 predictions for manned trips to Mars. We often think of people in the 1950s and 60s as taking for granted the most outlandishly optimistic predictions for the future. But as we're continually reminded, people of the past weren't stupid. Or, at least, they were no more stupid than the people of today.